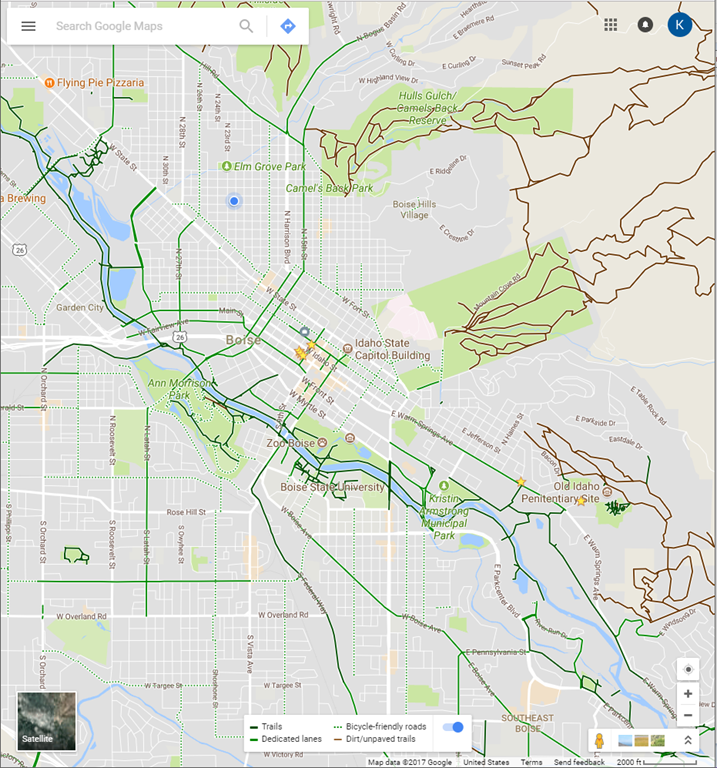 Since nothing says first world like Boise, Idaho, I thought it would be interesting to compare bike mapping between Google and OSM in my home town. When I tried this experiment a few years ago I quickly concluded that OSM just wasn’t up to the task. My what a few years make. I won’t pretend to have conducted a statistically compelling study—I just compared Google Maps and OSM for a few routes in town that I know well. OSM generally provided better bike routes, in one case surprising me with a route of which I wasn’t even aware. I use this route regularly now. I’d say OSM is now on par with Google Maps for bike routes in Google’s back yard (the US), and is in some cases better. In other parts of the world it’s the only option. Speaking of routing, a company called Mapzen now provides bike routing based on OSM data that optimizes for hills. About time! A user can specify their tolerance for hills (a fractional number between 0 and 1) and get routed accordingly. Their routing also considers the speed associated with the cyclists’ riding style (road, mountain, city, etc.) as well as their tolerance for riding with automobile traffic. Pretty cool. Beyond routing, Mapzen provides a map tile service that produces some beautiful maps that highlight detailed road information beneficial to cyclists. Like Google Maps, these are vector tiles that are rendered on-device, allowing significant customization in real-time without requiring an expensive round-trip to the server for a different tile. Labels that rotate independent of the map is just one example benefit. Below, compare a cyclist’s view of downtown Boise as rendered by Google and OSM. The OSM map shows more detail about the nature of the bike-friendly roads and paths, and looks better I think. 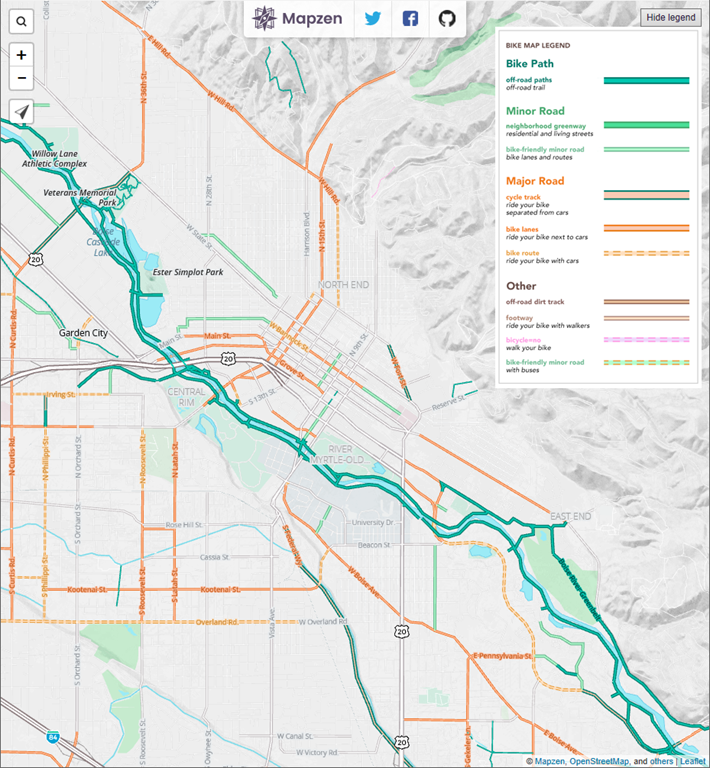 Here’s more information about Mapzen’s bike maps. There are also plenty of other services out there based on OSM. Like Google and the other map services, Mapzen mapping and routing services aren’t free. But also like Google, their terms of service are generous, making casual use effectively free. And they have the significant advantage that their source data (OSM), tiling engine, routing engine, etc. are all open source. Editing OSM maps is straightforward, well within reach of anyone with basic computer skills. Flooding last spring knocked out a couple of key bridges on the Boise greenbelt and I was frustrated that Google and OSM returned bad routes as a result. So I fired up the OSM editor and, after an hour or so of familiarization with the tool, easily removed the bridges. Within a few hours my changes showed on the map for everyone in the world to see, and within a day routing adjusted accordingly. This kind of power is quite addictive and surely beats whatever computer game that’s currently consuming your time :). Directly editing OSM maps is easier and faster than describing to Google what needs to change on their maps and then waiting to see when (if) the changes are incorporated. I’ve since added new sections of the greenbelt, businesses I care about, and missing connectivity between the greenbelt and surface roads. In many cases these changes are still missing in Google Maps. OSM lets you upload traces (GPS tracks) and map notes describing needed changes. When you fire up the OSM editor, the traces, notes, and an overlay of Bing satellite imagery makes it pretty easy to reconstruct the necessary changes. Lately I’ve been using an excellent map app called OsmAnd to generate the traces and enter map notes. It also lets you add POIs (points of interest) to OSM directly in the app. OsmAnd has some minor usability issues, perhaps not as slick as other navigation apps, but it works well and is feature-rich—probably a superset of features from most other navigation apps. It’s available on iOS and Android. Ever tried using bike paths to get somewhere specific in an area you’re not familiar with? Good luck with that. Connectivity of the various paths involved is generally hit or miss and the signage that might guide you through the trouble spots is either inadequate or non-existent. This is a problem ready-made for mobile map apps to solve but current mapping services, including those based on OSM and Google Maps, still don’t handle it very well. I’m hopeful that the combination of detailed, crowd-sourced map data and open-source routing engines will begin to chip away at this problem. Stay tuned.